Lékué are a Spanish cooking aid company, based in Barcelona, who have developed a number of interesting products for cooking in an oven while retaining steam (which encourages a better crust). They claim that their bread maker is a single tool for mixing, kneading and baking bread in, so I decided to buy one (£19.99 from Lakeland) and try it. Although it comes with an instruction and recipe book, feedback from people who had tried it was to use your traditional recipes. The bread maker is a slightly floppy silicone bowl that fastens at the top to form a rugby ball shape (see illustrations below). While it proved fine to mix the ingredients in and to bake the bread in, it did not prove that easy to knead the dough in (it really is too floppy), so I decided to try it out using the low effort (no knead) method so I really could do everything in the bread maker. This also meant I could go for a wetter dough for a more open crumb. This is how it worked out. Got the starter out of the fridge and brought it up to room temperature for two hours. 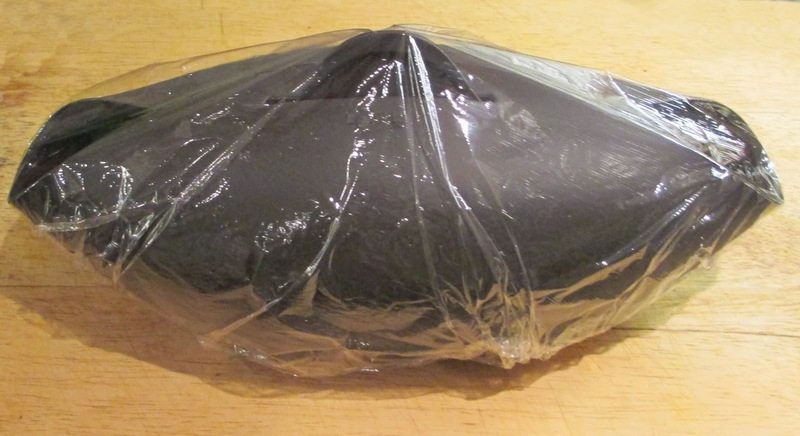 Closed the Lékué, covered it with cling film (see illustration left) and left it to prove overnight. In the morning the sponge was fermenting nicely (thick and bubbly). I mixed in the other half of the flour (but not the salt), closed the Lékué, covered it and left it to rest for 30 minutes. Then I dissolved the salt in a small amount of water, added it to the dough, mixed for 15 seconds, closed the Lékué, covered it and left to rest for another 15 minutes. Once more mixed the dough for 15 seconds and left to rest for another 15 minutes. Then gave the dough one final 15 second mix, shaped it roughly into a sausage in the Lékué, closed the Lékué, covered it and left it to prove in a warm place (the oven with the light on) for around 2½ hours until nearly doubled in size. Once risen, I uncovered the Lékué but left it closed, put it in the centre of a cold oven and baked for 30 minutes at 230°C (190°C fan). Then removed the loaf from the Lékué and baked it for another 20 minutes until golden. Then turned the oven off and left the loaf in the cooling oven, with the door slightly open for another five minutes, then placed on a rack to cool. The loaf had a nice crisp crust so the Lékué lived up to its promise in that respect. Once cooled I sliced the loaf. The crumb was nice and open and had an excellent sourdough taste and feel. So the low effort method had paid off as well. While I was about it I wondered how it would work out with my soda bread recipe so that was what I tried next. Once again I did everything in the Lékué using 200g wholemeal + 150g strong white + 1tsp soda + 1tsp salt and 350ml buttermilk. Mix together adding a little more milk to get a soft, sticky dough, shaped it roughly and baked for 25 minutes + 10 minutes out of the bread maker. It produced an excellent loaf of soda bread, nice crisp crust and a lovely texture crumb. I decided to name it 'Hedgehog Soda Bread' as that's what it reminds me of. Well done again Lékué. I decided to try out some Goldrush Old Fashioned San Francisco Style Sourdough Starter (from Bakery Bits) for a change from my own home grown starter. Mixed 100g white bread flour and 200g filtered water in a glass mixing bowl, then added the sachet of sourdough starter, covered the bowl with cling film and put in a warm place for six hours. Fed the starter with a small cup (50g) of flour and the same volume of water, covered and left in a warm place for a further 24 hours. Fed the starter with a small cup of flour and a small cup of water, gave it a good stir, covered and left in a warm place for another 24 hours. The starter is getting more active each day but was a bit runny. Discarded one cup of starter and fed it with a small cup of flour and half a cup of water. By day 6 the starter looked ready to use. Nice texture and crumb, soft and chewy inside nice crisp crust on the outside and it tasted good. We ate the second second half of the loaf for lunch the following day and it was still excellent. I've now decided to throw away my old starter and stick with this one from Goldrush, it's a real winner! If you check out some baking web sites and blogs, you will find that one of the biggest issues is about getting a nice crisp crust on your bread. The answer is providing steam in the oven during the early part of baking. Professional bakers use sealed ovens that have steam pipes to provide steam just when it is needed. Unfortunately most domestic ovens are not sealed and have no provision for creating steam. The simple answer is to put some cold water (or even ice cubes) in a hot dish in the bottom of the oven as set out in this recipe. Too little water will not produce enough steam and too much will stop the crust crisping. So measure it accurately and if there is any water left in the dish half way through the bake take it out and reduce the amount of water the next time. Another option is to get a water spray/atomizer and squirt water into the oven several times during the early stages of baking. Some people swear by this technique but it does mean keeping opening the oven door. 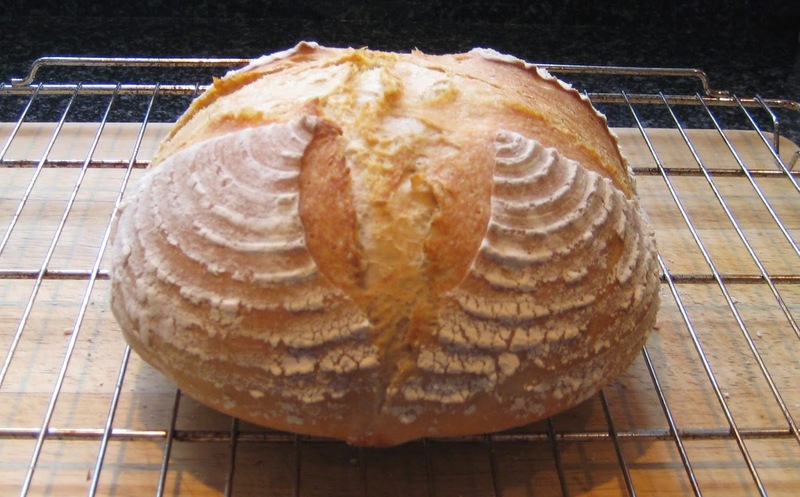 The best method is to enclose the loaf during the early part of the bake (as the dough itself gives off steam) using a covered casserole dish, metal Dutch oven or a cloche (baking dome). Then remove the lid part way through baking so that the crust crisps up. Having worked my way through every combination of the variations in the previous post, I finally arrived at the one method that works for me every time and produces really good bread. I usually bake in the morning so the following method starts in the evening, but if you want to bake in the evening just start in the morning, the steps are the same in either case. This recipe will produce a 660g loaf (about 1½ pounds), using a bread tin or baking tray. Get the sourdough starter out of the fridge and bring it up to room temperature for about 2 hours. 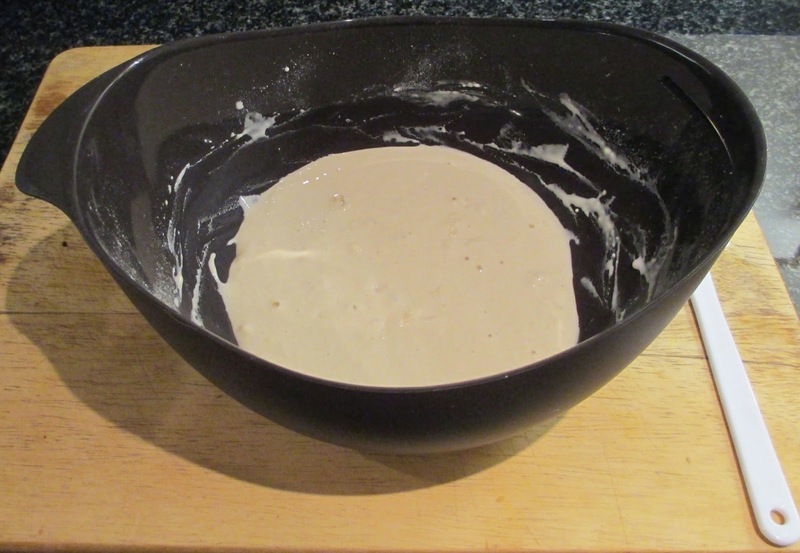 Make a sponge by mixing the sourdough starter, water and half the flour but not the salt and leave it in the mixing bowl covered with cling-film overnight in a cool place. In the morning remove the cling film and the sponge should be fermenting (thick and bubbly). Add the other half of the flour and salt and mix well. Add more flour or water if necessary but keep the dough as sticky as possible. Shape the dough and put it in a bread tin or on a baking sheet, dust with flour, cover with a tea towel and proof in a warm place for two to three hours until nearly doubled in size. Slash the top of the loaf with a sharp bread knife and put it in on a low shelf in the oven. Put 100ml of water into an ovenproof dish in the bottom of the oven (to create steam) and set the oven to 230°C (190°C fan), 450°F or gas mark 8. Bake for 35 to 40 minutes once the oven has got up to temperature or until the crust is golden, turn the oven off and leave the bread in the cooling oven, with the oven door slightly open, for another 5 minutes, then turn the loaf out onto a rack to cool for at least an hour. 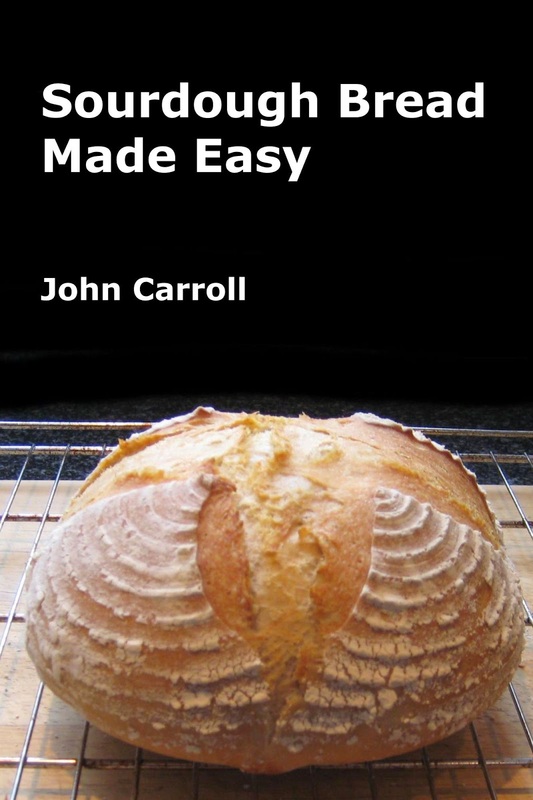 I began making my own bread a few years back, first using a bread machine and then by hand. I produced white bread, whole meal bread and mixed grain bread along with French baguettes and pizzas. All produced using dried yeast with good results (after some initial teething troubles) but I always had a yearning to try sourdough bread. Two things put me off: the many conflicting methods and the need to produce a sourdough starter before being able to make sourdough bread. It all sounded a bit tricky and time consuming but I was wrong, it turned out to be simplicity itself! The final three steps are exactly the same as baking with baker’s yeast, the only difference is that the proving time is much longer (typically six to twelve hours rather than two hours). The longer proving time is because the natural yeast in the sourdough takes longer to prove than commercial baker’s yeast. I will expand on the four steps over the next four blogs, starting with producing the sourdough starter, so watch this space.